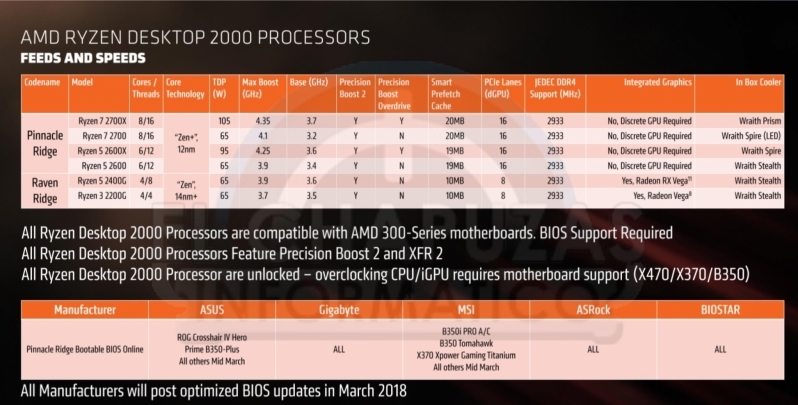 Wait... there isn't a 2800X? Read more about AMD's Ryzen 2nd Generation CPU and 400-series chipset. TBH 3Dmark has never really liked AMD CPUs at all. You need to remember though this is literally a refresh. Intel got 3-5% so yeah, don't be over hopeful. It might turn out to be equally as pointless as buying every Intel refresh, too. Might wanna skip a couple then get one. The bottom two charts, the ones comparing gaming performance, actually say "AMD Ryzen 5 launch - April 11 2017". I mean, come on OC3D, you're not even trying. In any case, you guys should have gone to Specsavers. Oh yeah, (this is hilarious) I'm not even wearing my glasses right now and I still was able to see it! What's not clear to me is how the 2700X can get lower FPS in Crysis 3, considering the faster clocks and supposed architectural improvements. This looks remarkably still like a refresh. X470 motherboards with good cooling will see out of the box superior performance, but X370 users should be able to overclock their 2000 series CPUs to similar clock speeds. From what we've been shown, the only gains appear to be in clock speed and under the hood efficiencies, which are really not that essential for enthusiasts.